As the old saying goes: each time you fall off your bike get straight back on... or something like that. And so with my last post I climbed back on the blogging bike. I've had a really busy week and I've been grateful for my self imposed blog break. Not only did I not blog, but I also didn't read blogs, which is a big change for me. Stuart has taken Roxy to visit his family for the last few days so I've had a lot of time to really focus and get things done. I've accomplished a lot and feel in somewhat less of a spin. To be honest I haven't really addressed any of the issues that led to my blog post last week, which isn't good, but I feel more in control. For a control freak like me that's a good thing! Thanks again for all your lovely thoughts, comments and emails. It's so nice to have your understanding and friendship. I'm sorry that I haven't replied to you individually - I'm sure you'll understand why given my current struggle to stay on top of things. 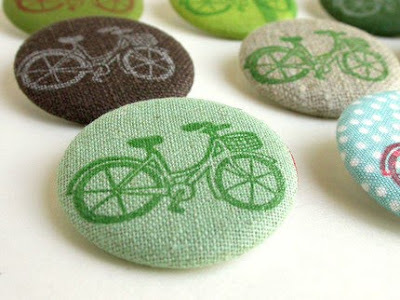 Now I want to tell you about the sweet bicycle buttons and pouches in the photos above. I did an Etsy search for 'bike' looking for an image to go with this post, and came across Laura Bucci's shop. 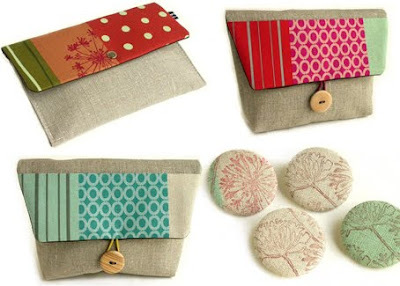 I love the combination of natural linen and gorgeous coloured fabrics Laura uses in her pouches and wallets. They look like they're beautifully made too. Enjoy your weekend my friends! See you Monday.